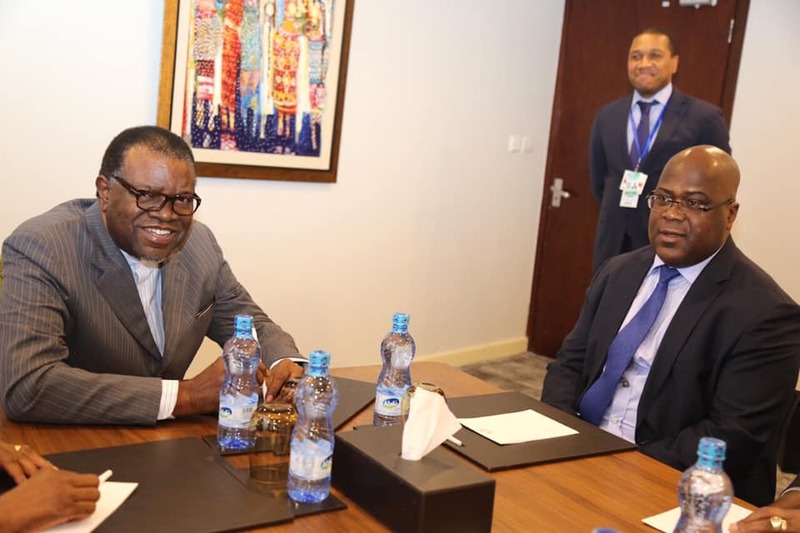 Pictured: The President of Namibia, Dr. Hage Geingob and the newly elected President of the Democratic Republic of the Congo, His Excellency Felix Tshisekedi. Photo: Courtesy of the Namibian Presidency. The current state of affairs in the Democratic Republic of the Congo and Zimbabwe was high on the agenda of a special meeting of the heads of state of member countries of the Southern African Community held on the sidelines of the 32nd Ordinary Summit of the African Union currently underway in Addis Ababa. 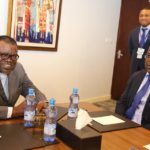 At the brief meeting the President of the Namibia in his capacity as the Chairman of the SADC, called on the newly elected president of the Democratic Republic of the Congo, President Felix Tshisekedi and President Emmerson Mnangagwa of Zimbabwe to brief him on recent developments in their respective countries. I am honoured to address this brief meeting of SADC Heads of State and Government. I thank you for honouring my invitation and for attending this meeting as we seek to consolidate our regional efforts as a united family. Before I proceed with my remarks, allow me to take this opportunity to extend my hearty congratulations to two of our newly elected leaders in the region, namely H.E Andry Rajoelina of Republic of Madagascar and H.E Felix Tshisekedi of the Democratic Republic of Congo (DRC). Your Excellencies, on behalf of the leaders of all SADC Member States, I would like to welcome you to the SADC family and wish you all the best in your new mandates. With regard to the political situation in the region and following my consultations with SADC Heads of State and Government on the consolidation of political processes in our region, in my capacity as the Chairperson of SADC, I saw it necessary to take advantage of the ongoing AU meetings to provide SADC Heads of State and Government with an opportunity to engage on the matter, and receive first hand briefings from some of our Member States. I am confident that this will allow us to have a common understanding on issues of our collective interest, and facilitate a common approach as we continue to provide support to our region. You will recall that at the 38th Session of the Summit of the SADC Heads of State and Government in Windhoek, Namibia, we had decided to convene an international conference in solidarity with the people of Western Sahara. May I extend our appreciation to our dear brother, H.E. Mr. Cyril Ramaphosa who has agreed to host this conference which is now slated to take place from 25 to 26 March 2019, in Pretoria, South Africa. During our consultations, I will ask the Ministers of International Relations and Cooperation of Namibia and South Africa, being chair and host respectively, to brief us on the status of preparations for this conference. At this juncture, I would like to invite H.E. Felix Tshisekedi, President of the Democratic Republic of Congo to update the meeting on some of the recent developments in the DRC, and in particular on how SADC as the region can continue providing support to the consolidation of democracy in the DRC. Thereafter, I will request H.E. Emmerson Mnangagwa to update our meeting on the political and socio-economic situation in Zimbabwe.